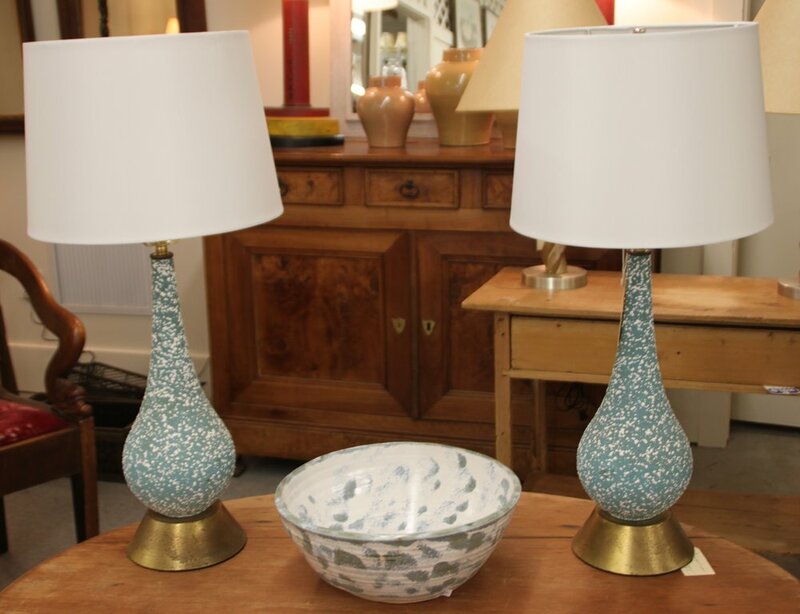 A pair of Chinese porcelain, craquelure glazed table lamps. 13” body, 23” to finial. An unpainted tea canister table lamp. 20” body, 32” to finial. A pair of sleek white glass ginger jar form glass table lamps. 19” body, 29” to finial. A pair of brass and black marble table lamps. 28” to top of finial. A sleek mid century, turned wood table lamp. 18 1/2” body, 34 3/4” to top of harp. A lemony yellow, crackled glass table lamp on wooden base. 18” body, 29 1/2” to top of shade. 17” body, 27 1/2” to top of harp. A pair of bright blue mid century , ceramic lamps, likely Italian. 23” body, 31 1/2” to top of harp. A rusty red Chinese porcelain, baluster form table lamp. 22" to body, 32" to harp. A single lava glazed mid century, ceramic table lamp on wooden base. 25" body, 35" to top of harp. Large pair of lamps made form industrial casting forms.